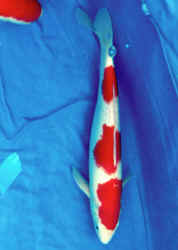 Kohaku are white bodied koi with red markings (sometimes more orange than red)... Ideally the white of the body is like fine porcelain in color, with the red well-demarcated (not "bleeding"). Red is undesirable on the fins, and unless specified in a particular sub-variety, not below the eyes or on the mouth. Straight Hi: Pattern like meandering islands of red that are interconnected. Inazuma: Interconnected red pattern looking "Like a Lightning Bolt". Nidan (Ni is two in Japanese): Two Step pattern. Two islands of red color that are not interconnected. Sandan (San is three in Japanese): Three Step pattern. Three islands of red color that are not interconnected. Yondan (Yon is four in Japanese): Four Step pattern. Four islands of red color that are not interconnected. Kuchibeni: "Lipstick"; with red on the oral lobes. Menkaburi: With "A Hood on the head". Going behind, below the eyes often to the mouth. Maruten: With a "Crown on the head". A reddish mark, though with more red on the body. Tancho: With a "Red Sun" marking on head, and lacking other red on the body. Best if the "spot" is bright red, w/o bleeding color, and circular, centered on the head.